Alfa Laval rotary impingement tank cleaning devices use patented technology that combine pressure and flow to create high impact cleaning jets. Cleaning occurs not just where the concentrated stream impacts the surface, but also through the tangential force that radiates from that point and blasts contaminants from the surface, scouring the tank interior. High-impact cleaning jets are delivered in a precise, repeatable and reliable, 360° pattern. This combination of impact in a controlled indexing pattern results in an economic ideal, because impact is a one time investment; chemicals, temperature and time are continual, never-ending expenditures. Impact (also known as impingement) - Two or more jet streams scour the tank interior and blast away residue and contaminants. Precision - Ensures every square inch of the tank has been contacted by a jet stream and/or its tangental force. This combination ensures the tank or vessel is thoroughly cleaned, every time. 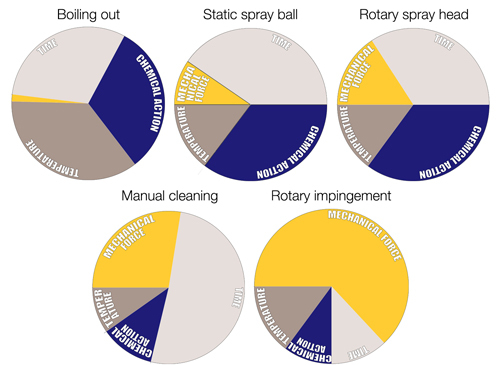 Impingement is what sets Alfa Laval tank cleaning devices apart from other automated tank cleaners. Imagine your garden hose and a mud ridden fence. Without a nozzle, water falls from the hose. This water over time may “erode” away the mud on the fence, however if you were to slide your thumb over part of the opening, pressure builds behind the water and blasts away the mud. As it hits the fence, it radiates outward, maintaining low pressure and flow, but optimizing the impact or mechanical force. This is impingement. Force - Alfa Laval tank cleaners are capable of creating up to 85 lbs (39 kg) of force at a 25 ft. (7.5 m) distance with minimal pressure and flow. This is impossible with any other technology. Our rotary impingement process is mechanically engineered (gear-driven) to scour every square inch of the tank or vessel in a repeatable and reliable manner. As the nozzles rotate on a vertical plane, they index two-degrees on a horizontal plane, creating a repeatable and reliable, full-coverage, pattern. The speed of rotation is mechanically designed into the machine based on pressure and flow. If pressure and flow remain constant, the cleaning pattern remains constant and the machine cleans in the exact same pattern at the exact same speed, every time. Wear parts have no effect on this process, making it 100% validatable. Alfa Laval Rotacheck is a validation accessory available for extra assurance. How do these four factors work together? Think about washing dishes. Hot water (temperature) is going to remove stuck on food better than cold. Adding soap (chemical reaction) makes the process even easier, and you can either soak a dish overnight (time) or scrub the dish clean (mechanical action). When the effectiveness of any factor is increased, it will result in a decrease of one or multiple other factors. Our rotary jet heads maximize mechanical action, resulting in a drastic reduction of the three remaining factors; time, chemical and temperature. Our rotary impingement devices are designed to offer the optimal output of force with the least flow and pressure to create the most effective and efficient cleaning. Ask our tank cleaning experts how you can optimize tank cleaning for your specific application. With the combination of the Toftijorg and Gamajet designs, Alfa Laval has the most complete tank cleaning portfolio in the world. Our patented technology and decades of experience guarantees a cleaning solution for your specific application. The product line contains solutions for Sanitary Applications such as Pharmaceutical, Personal Care, Food & Beverage, Dairy, Brewing and Wine. We also offer solutions for Industrial Applications like Ethanol, Petroleum, Chemical and Transportation. Regardless of the application, Alfa Laval offers the most reliable and durable solution. Contact our experts for a solution to your tank cleaning needs. Alfa Laval tank cleaning machines are designed to replace the need for manual entry tank cleaning. 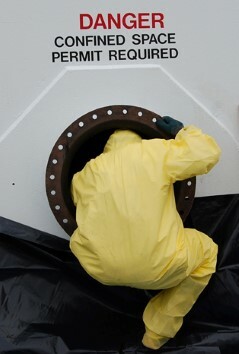 Devices may be permanently installed or used portably from tank to tank. For the portable applications, tank cleaning devices are dynamically balanced so that they may be lowered into a tank on a flexible hose. We have also developed a variety of other accessories to reduce this risk, if entry above the tank is unavailable, such as the portable cart or tri-pod. Companies that were manually cleaning, or required to touch up cleaning in areas in which other automated tank cleaning machines have failed, have experienced 100% elimination of confined space entry as it pertains to cleaning. Ensure the utmost safety when cleaning tanks with the elimination of confined space entry and the limiting of fall potential. Our tank cleaning devices can be lowered into tanks with hazardous gases and environments that are potentially fatal to employees. With our products, the dangers involved in such activities are nearly eliminated, allowing for safer work environments and peace of mind – priceless. Obtain the sustainable goals designed to protect our world. Through tank cleaning optimization, customers experience water savings nearing 80% and energy savings averaging around 85%. As a result greenhouse emissions and the environmental impact is significantly reduced. Tank cleaning is typically the number one culprit in water waste. Many customers have obtained their company wide water savings goals through this simple implementation. Experience significant savings of expenditures such as time, chemicals and other operating costs. In addition, the significant savings in time allow for an increase in production and a recovery in revenue resulting in an honest profit. As a result, customers can maintain the former objectives of positively impacting the community and decreasing the negative impact on the environment in perfect harmony with the final bottom line.